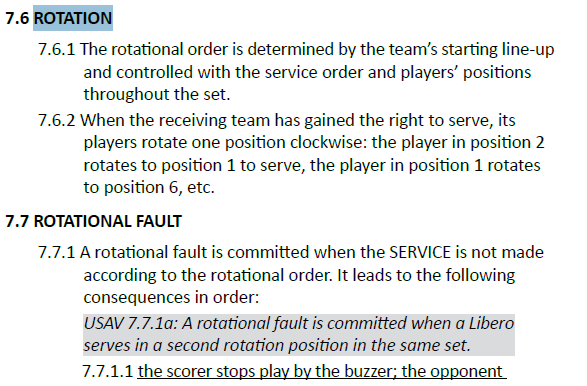 Volleyball rotation rules including overlaps and positional faults. An overlap occurs when at the moment of serve contact, players on a team are overlapping positions on the court. And judgement is made by the position of the foot. Left front needs to be closer to the center line than left back. Left front needs to be closer to the left side line than center front. Right front needs to be closer to the center line than right back. Right front needs to be closer to the right side line than center front. Left back needs to be closer to the left sideline than the center back player. Right back needs to be closer to the right sideline than the center back player. So basically, it's centerline and sideline that is the focus. For example, the left front player can straddle the middle front player and also the left back player because it's where the left front players (closer to the left side line) that's important. 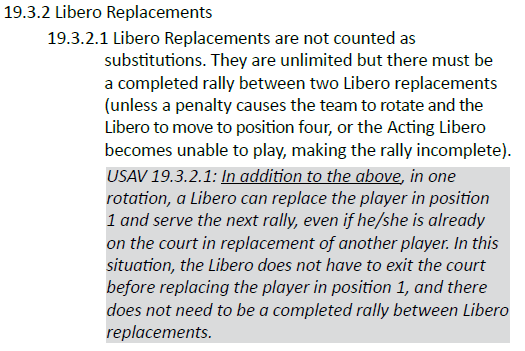 Players rotate clockwise when the team wins the right to serve. The players follow a serving order. Each player should serve after the same player in the line up. 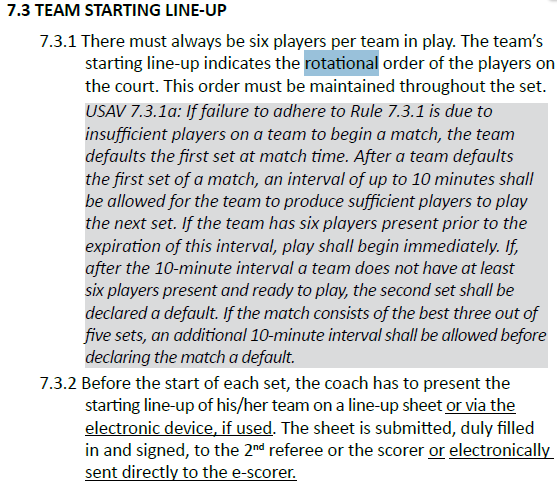 If a team is uncertain who the next server should be, the coach or captain can request a line-up check. 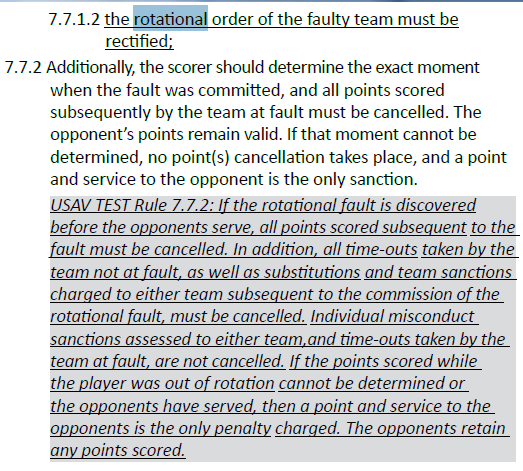 If the the team serves with the wrong player, the scorer should immediately inform the R2 who then blows the whistle and calls a positional fault. The coach or captain can request a line-up check as many times as they desire as long as the referee doesn't think the team is trying to delay the match. 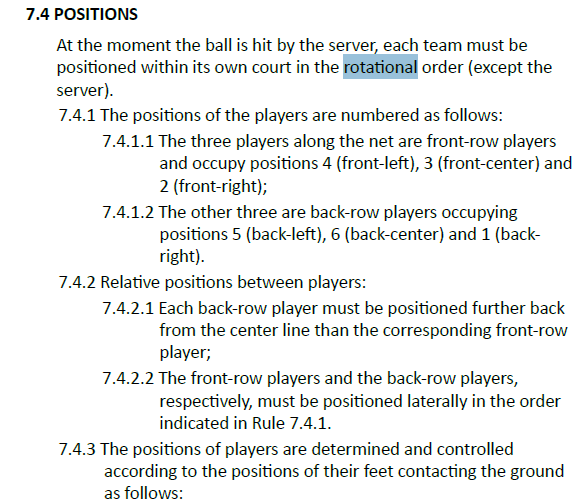 You can see in the above diagram, the player in position 4 only needs to worry about players in position 5 and 3 (when concerned about overlapping during the serve). Player in position 3 worries about players in position 6, 4 and 2. Players in position 2 worries about players in position 1 and 3. Players in position 1 worries about players in position 2 and 6. Players in position 6 worries about players in position 1, 5 and 3. Players in position 5 worries about players in position 6 and 4. Players in position 4 worries about players in position 5 and 3.